We pride ourselves in creating learning that is relevant to you and as this is the case, we don’t have any ‘off the shelf’ packages. However the workshops that are listed on the right are ones that have been facilitated in the past and give you an idea of what we can do. 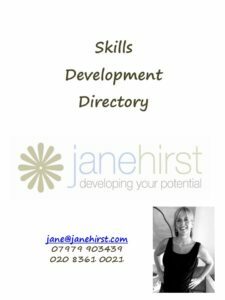 Download our Skills Development Directory by clicking on the booklet on the left. In everything we do, we create climates of learning and support to encourage and motivate each person to try out their new or refined tools in a ‘safe’ environment. This provides them with lots of opportunity to practice their skills and find out what works for them so that they are authentic when they bring it to life in the workplace. What we do is fun, participative and extremely interactive. When you enjoy what you do it encourages retention of information long after the learning has ended which makes the money you spend on development a sound investment. The learning that you receive depends on the intensity you require. You may feel that two hours is enough or perhaps even half a day. Some workshops work better as one, two or three day sessions. However, that’s up to you and the results you’d like to see.